When the Book of Mormon first appeared for sale in early 1830, questions surfaced regarding its claim to be an ancient history of the Americas. New Approaches to the Book of Mormon: Explorations in Critical Methodology outlines the broad contours of contemporary scholarship which continue to examine issues of antiquity. Drawing from a variety of disciplines, contributors discuss historicity from the standpoint of physical and cultural anthropology, geography, linguistics, demographics, literary forms, liturgical context, theology, and evolution of the original manuscript to published work. The message of the Book of Mormon is one of socio-economic equality and divine intervention. That message can sometimes be obscured by polemical use of the book as a prooftext for elitist and institutional agendas over personal religious experience. The Book of Mormon has become an icon that is revered more than understood, according to the contributors. Attempts to make the book relevant often gloss over context. Returning to a nineteenth-century understanding of the text restores the book’s spiritual rather than symbolic importance. 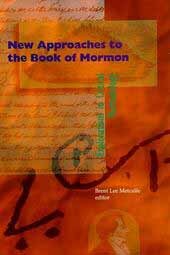 Among contributors to New Approaches to the Book of Mormon are David P. Wright, Assistant Professor of Hebrew Bible and Near Eastern Studies, Brandeis University; Deanne G. Matheny, former Instructor of Anthropology and Archaeology, Brigham Young University; Stan Larson, Senior Researcher, Utah Philosophy and Religion Archives, Marriott Library, University of Utah; Edward H. Ashment, former Supervisor, Scripture Translation Services, Church of Jesus Christ of Latter-day Saints; Melodie Moench Charles, MTS graduate, Old Testament, Harvard Divinity School; and Anthony H. Hutchinson, Ph.D. candidate, Biblical Studies, Catholic University. New Approaches to the Book of Mormon will modify, even transform previous theories regarding the nature of Mormon scripture. Painstaking research undergirds the ten essays included in this compilation. Contributors share with readers a wealth of fresh perspectives and offer an array of new directions for future Book of Mormon research. about the editor: Brent Lee Metcalfe is a technical editor for the computer industry in Utah. His essay, “Joseph Smith’s Scriptural Cosmology,” was published in The Word of God: Essays on Mormon Scripture. He has moderated panels on the Book of Mormon for the B. H. Roberts Society and Sunstone symposia and has published on related topics. © 1993 Smith Research Associates. Printed and bound in the United States of America by Signature Books. ∞ Printed on acid free paper. [edited by] Brent Lee Metcalfe. p. cm. Includes bibliographical references. 1. Book of Mormon–Criticism, interpretation, etc. According to Joseph Smith, the Book of Mormon is “the most correct of any Book on Earth & the key stone of our religion & a man would get nearer to God by abiding by its precepts than any other Book.”1 Since publication in 1830 it has retained its centrality in the Church of Jesus Christ of Latter-day Saints and the Reorganized Church of Jesus Christ of Latter Day Saints by providing the impetus for millions of conversions and the inspiration for weekly devotional sermons. In addition, growing numbers of religious scholars no longer consider Mormonism’s generative text a curiosity unworthy of serious investigation. Interest in the Book of Mormon has already cultivated resourceful studies, and this trend promises to refine perceptions of Mormon scripture as history and theology. In biblical scholarship “criticism” and its cognates are not used pejoratively but denote rigorous, balanced scrutiny of sacred texts. Critical methodology incorporates textual criticism, historical criticism, redaction criticism, form criticism, structuralism and semiotics, narratology, economic- and gender-oriented readings, and the application of sociology, anthropology, and archaeology.2 Fresh intellectual and spiritual vistas have been opened by viewing sacred literature from the vantage of these methods. Similarly New Approaches to the Book of [p.x] Mormon attempts to expand appreciation of Mormon scripture through critical analysis. The application of literary- and historical-critical methods to the Book of Mormon allows for the possibility that it may be something other than literal history. In fact, tolerance for nontraditional views of Mormon scripture and pluralistic expressions of faith are increasingly common. Leonard J. Arrington, former LDS Church Historian, has reflected, “I was never overly concerned with the question of the historicity of the First Vision or of the many reported epiphanies in Mormon, Christian, and Hebrew history. I am prepared to accept them as historical or as metaphorical, as symbolical or as precisely what happened. That they convey religious truth I have never had any doubt” (1985, 37; cf. 1986, 230; 1992, 307). Henry Eyring, a prominent Mormon scientist, was equally unconcerned by the prospect of modern elements in the Book of Mormon: “I’ve often said that I would be delighted to have someone point out some flaw in the Book of Mormon that proved that Joseph Smith made an error in translating or inserted some idea of his own that wasn’t on the plates.… [T]hat would merely prove that he was human, a fact about which I was already quite sure” (1983, 45). After probing the Book of Mormon from the perspective of archaeology, Lowell L. Bennion surmised that the volume “is not a textbook in any science, not even an historical account or a theological treatise, but a religious record of three migrations to the Western Hemisphere” (1985, 2). Raymond T. Matheny, Professor of Anthropology at Brigham [p.xi] Young University and noted Mesoamericanist, added that in view of secular archaeological research, the Book of Mormon has “no place in the New World whatsoever” (1984). Past president of the Utah Psychiatric Association R. Jan Stout observed that the Book of Mormon has deeper meaning in people’s lives than a history book could provide: “There is an aphorism that states that a myth is ‘something that was never true and always will be!’ This, I submit, will be the fate of this fascinating Mormon scripture. It does indeed meet the spiritual, emotional, and psychological needs of a great many people who love and revere its story. They do not want to be challenged with scientific claims that erode authenticity but prefer to live with the certainty that the Book of Mormon provides to their lives. Yet others prefer to pursue their reality and open study wherever it takes them. Each of us must make the choice, but authority and dogma cannot be the ultimate reality test where free thought and open inquiry are allowed to flourish” (1990, 5). Contributors to New Approaches to the Book of Mormon address a variety of methodological, historical, and theological concerns in the belief that readers will come away better for having approached the Book of Mormon from these new perspectives. Mormon scripture deserves more sophisticated scrutiny than has been previously accorded, and readers deserve the results of cutting-edge research without primary reliance on technical jargon or apologetics. Some readers may find the following essays too “secular,” while others may find them too “religious.” However, those with less partisan objectives will discover an array of new directions for Book of Mormon research. We are not so much interested in convincing readers to think as any of us do, but simply in encouraging them to think for themselves. 1. Wilford Woodruff’s Journal, 28 Nov. 1841 (in Kenney 1983-85, 2:139). This journal note is the source for the entry in the History of the Church (Smith et al. 1978, 4:461). 2. Introductions to critical methods are available in Armerding 1983; Black and Dockery 1991; Conzelmann and Lindemann 1988; Fee 1983; Hayes and Holladay 1987; Kaiser and Kümmel 1981; Marshall 1977; Soulen 1981; Stuart 1984; and Tuckett 1987. The multi-volume Guides to Biblical Scholarship are informative primers: Beardslee 1969; Boers 1979; Dory 1973; Gamble 1985; Habel 1971; Klein 1974; Krentz 1975; Lance 1981; McCarter 1986; Mack 1990; McKnight 1969; Miller 1976; Neusner 1987; Patte 1976; 1990; Pertin 1969; Petersen 1978; Powell 1990; Rast 1972; Robertson 1977; Sanders 1984; and Wilson 1984. Armerding, Carl E. The Old Testament and Criticism. Grand Rapids, MI: Eerdmans Publishing Company, 1983. Arrington, Leonard J. “Why I Am a Believer.” Sunstone 10 (Jan. 1985): 36-38. ______. “Why I Am a Believer.” In A Thoughtful Faith: Essays on Belief by Mormon Scholars, 225-33. Edited by Philip Barlow. Centerville, UT: Canon Press, 1986. ______. “Epilogue: Myth, Symbol, and Truth.” In Faithful History: Essays on Writing Mormon History, 303-10. Edited by George D. Smith. Salt Lake City: Signature Books, 1992. Beardslee, William A. Literary Criticism of the New Testament. Philadelphia: Fortress Press, 1969. Bennion, Lowell L. The Book of Mormon: A Guide to Christian Living. Salt Lake City: Deseret Book, 1985. Black, David Alan, and David S. Dockery, eds. New Testament Criticism and Interpretation. Grand Rapids, MI: Zondervan Publishing House, 1991. Boers, Hendrikus. What is New Testament Theology? Philadelphia: Fortress Press, 1979. Conzelmann, Hans, and Andreas Lindemann. Interpreting the New Testament:An Introduction to the Principles and Methods of N.T. Exegesis. Peabody, MA: Hendrickson Publishers, 1988. Eyring, Henry. Reflections of a Scientist. Salt Lake City: Deseret Book, 1983. Fee, Gordon D. New Testament Exegesis: A Handbook for Students and Pastors. Philadelphia: Westminster Press, 1983. Habel, Norman. Literary Criticism of the Old Testament. Philadelphia: Fortress Press, 1971. Hayes, John H., and Carl R. Holladay. Biblical Exegesis: A Beginner’s Handbook. Atlanta: John Knox Press, 1987. Kaiser, Otto, and Werner Kümmel. Exegetical Method: A Student’s Handbook. New York: Seabury Press, 1981. Kenney, Scott G., ed. Wilford Woodruff’s Journal: 1833-1898, Typescript. 9 vols. Midvale, UT: Signature Books, 1983-85. [p.xiii] Krentz, Edgar. The Historical-Critical Method. Philadelphia: Fortress Press, 1975. Lance, H. Darrell. The Old Testament and the Archaeologist. Philadelphia: Fortress Press, 1981. Mack, Burton. Rhetoric and the New Testament. Minneapolis: Fortress Press, 1990. Marshall, I. Howard, ed. New Testament Interpretation: Essays on Principles and Methods. Grand Rapids, MI: Eerdmans Publishing Company, 1977. Matheny, Raymond T. “Book of Mormon Archaeology: A Panel Discussion.” Delivered at the 1984 Sunstone Symposium. McCarter, P. Kyle, Jr. Textual Criticism: Recovering the Text of the Hebrew Bible. Philadelphia: Fortress Press, 1986. McKnight, Edgar V. What is Form Criticism? Philadelphia: Fortress Press, 1969. Miller, J. Maxwell. The Old Testament and the Historian. Philadelphia: Fortress Press, 1976. Neusner, Jacob. What is Midrash? Philadelphia: Fortress Press, 1987. Patte, Daniel. What is Structural Exegesis? Philadelphia: Fortress Press, 1976. ______. Structural Exegesis for New Testament Critics. Minneapolis: Fortress Press, 1990. Perrin, Norman. What is Redaction Criticism? Philadelphia: Fortress Press, 1969. Petersen, Norman R. Literary Criticism for New Testament Critics. Philadelphia: Fortress Press, 1978. Powell, Mark Alan. What is Narrative Criticism? Minneapolis: Fortress Press, 1990. Rast, Walter E. Tradition History and the Old Testament. Philadelphia: Fortress Press, 1972. Roberts, B. H. “Higher Criticism and the Book of Mormon.” Improvement Era 14 (June 1911): 665-77; 14 (July 1911): 74-86. Robertson, David. The Old Testament and the Literary Critic. Philadelphia: Fortress Press, 1977. Sanders, James A. Canon and Community: A Guide to Canonical Criticism. Philadelphia: Fortress Press, 1984. Soulen, Richard N. Handbook of Biblical Criticism. Atlanta: John Knox Press, 1981. Stout, R. Jan. “Mythologizing the Book of Mormon.” Sunstone 14 (Dec. 1990): 4-5. Stuart, Douglas. Old Testament Exegesis: A Primer for Students and Pastors. Philadelphia: Westminster Press, 1984. [p.xiv] Tuckett, Christopher. Reading the New Testament: Methods of Interpretation. Philadelphia: Fortress Press, 1987. Widtsoe, John A. In Search of Truth: Comments on the Gospel and Modern Thought. Salt Lake City: Deseret Book, 1930.